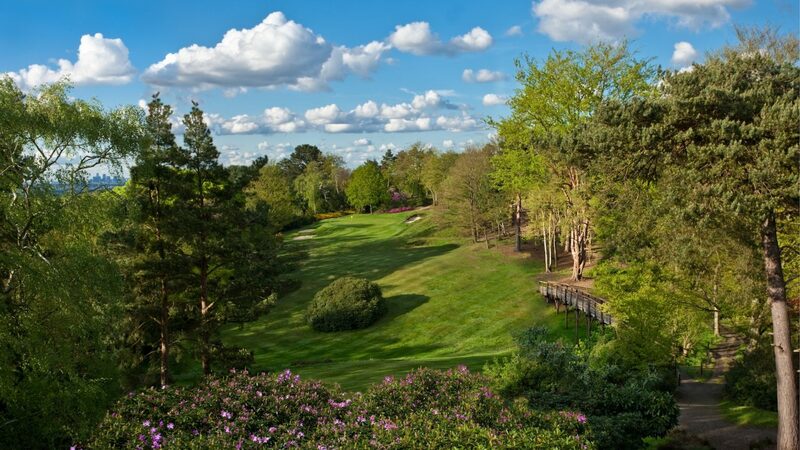 Currently ranked at 27 in Golf World’s Top 100 Courses England, The Addington Golf Club is the flagship course in The Altonwood Group’s portfolio. With a rich and interesting history, The Addington was designed by JF Abercromby in 1913 and first opened for play in 1919, soon becoming a favourite of the rich and famous. Reaching its heyday in the 1930s, it was written about by many famous writers of the time and played host to film stars, golfing legends and even royalty – King George VI became Patron in 1937! Today, having undergone a 10 year refurbishment programme resulting in the rebuilding of nine tees, a new drainage system and a woodland management programme to expose some of the magnificent pine trees that are a feature of the course, The Addington presents a golfing experience you will not forget. A par 69, 6,300 yard course, affording expansive views of the metropolis from hilltop tees like those at the 14th and 16th, The Addington’s fairways wander through mature pine and birch trees to create a feeling of intimacy in stark contrast to the looming mast of Crystal Palace and the backdrop provided by the NatWest Tower, Canary Wharf and the Shard, just 12 or so miles away. Having retained its heathland beauty & restored wooden bridges which are a feature throughout, The Addington invites you to walk a course virtually unchanged since its creation. Society packages are available on all bookings of a minimum 8 players during the summer months. Our Winter Package offer is available on a minimum 2 players. Winter Package (1st November 2017 - 31st March 2019): Coffee, Bacon Roll & Unlimited Golf - £50 per person* *£60 if playing more than 18 holes in March Summer Packages (1st April to 31st October 2019): 18, 29 & 36 hole packages available with breakfast, lunch and dinner options, freshly prepared by our chef. Packages starting from £75 per person. Offers: 25% discount available on all society bookings in April and August. The Addington is located in Addington Village, just minutes from Croydon by car or tram, approximately 20 minutes from the M25 junctions 4 or 6 and is only 12 miles from London (nearest station East Croydon, where taxis or trams are available). Parking is available onsite. We welcome visitors 7 days a week. Please book online for our best rates: www.addingtongolf.com or call 0208 777 1055. We can recommend good hotels in Croydon and the surrounding area.